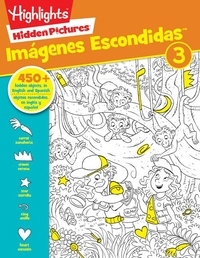 This bilingual four-volume collection of classic black-and-white Hidden Pictures(R) puzzles includes both English and Spanish labels to help kids build vocabulary while searching for hidden objects. This is an irresistible collection packed with more than 40 classic black-and-white Hidden Pictures(R) puzzles. Each puzzle is carefully designed to engage and entertain children while honing their concentration skills and attention to detail. With more than 450 objects labeled in both English and Spanish, this book provides kids of all ages with hours of puzzling fun while building and reinforcing vocabulary in both languages.